COLOSTAR kids chewable tablets are a dietary supplement that contains unique, bovine-derived food. It contains biologically active proteins, immunoglobulins, and nutrients for your child. It supports growth and development of your child. It is rich in high content of lgG. Sucrose, Skimmed milk powder, Whey powder, Magnesium silicate, Magnesium stearate, SiliconDioxide, Permitted flavours. 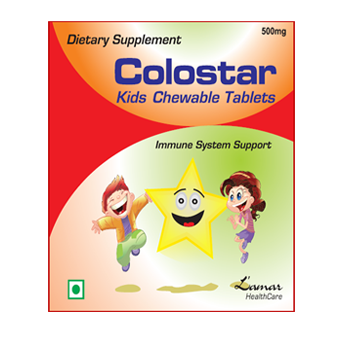 COLOSTAR kids chewable tablets work to make your child grow healthy and strong. For adults: Take 1-3 tablets every day. For children: Take 1-2 tablets every day. You can take the tablets anytime with food or on an empty stomach or as suggested by your healthcare professional.